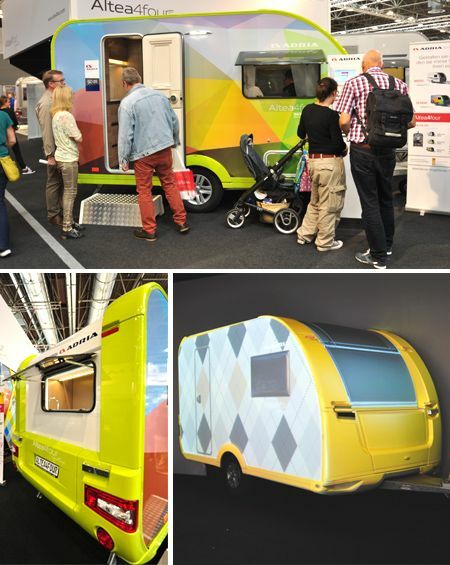 Taking place each year in Dusseldorf, Germany, Caravan Salon is thought to be the world’s largest show for caravans and motorhomes. 2014’s annual showcase was the best-attended in its history, counting some 192,000 visitors – some 60,000 of these stayed on site overnight in their own vehicles. Any colour you want? Including white? They may be Adria’s “starter” caravans, but the Altea range came to Caravan Salon with a real burst of multi-coloured patterns, thanks to an ever-changing display that beamed lots of designs onto a standard white body. Altea is also the range that Adria has focused most on for the UK for 2015, including prices some £990 less than equivalent models previously. 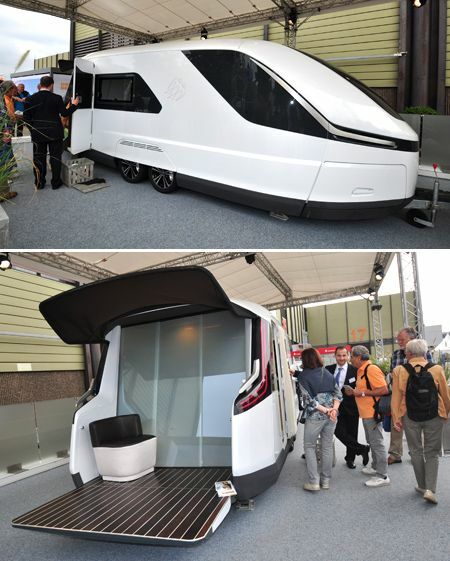 Visitors to October’s Motorhome and Caravan Show will have their first chance to see this, the Caraviseo concept. 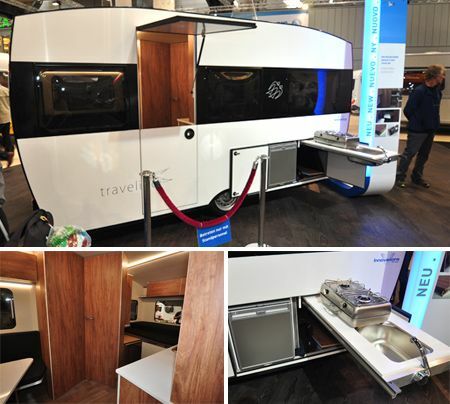 It was actually announced at last year’s Caravan salon in Germany, returning this time around as a vision of a caravan for the not too distant future. Among the innovations here are a full self-levelling/lowering system, rear that converts to a veranda, an internal sliding glass door that can be transparent or opaque, or act as a screen for DVD viewings etc, a shower that you can set to suit your contours, with programmable heat and power settings, keyless entry system (it recognises your fingerprints) and plenty more. And, of course, it can pretty much all be controlled via an app. It uses an all-new screw- and wood-free construction, but there’s more – or rather less – here that keeps the starting weight of this Travelino from Knaus down below 650kg, with a 4m body length. It also boasts green credentials thanks to extensive use of recycled materials. The Travelino was one of a number of initiatives unveiled by Knaus. Also on display was the more conventional looking Lifestyle, but with an interior that carries on the styling first seen in the Deseo, (another Knaus concept, which actually made it into full production). It centres around a “breakfast bar” area for dining, complete with high stools. 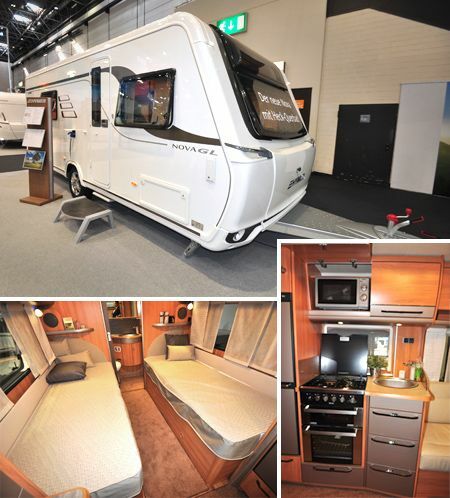 The new Nova series just might be the most significant caravan range from Hymer to hit the UK yet. Although there are SL and GL models for sale on the mainland, where they will use the Eriba name, here in the UK it’s just one line: Hymer Nova. Check out our detailed report on the 2015 Hymer Nova 580. That pictures here only partly reflect the extensive work that’s gone into producing a range that’s suitable to the requirements of the more upmarket UK caravanner. T@B tourers were always a bit extrovert, but this latest initiative moves things on again. Sure enough, the sidewall treatment is called Wood Style. Next year’s Caravan Salon, the 54th, takes place from August 29 to September 6. 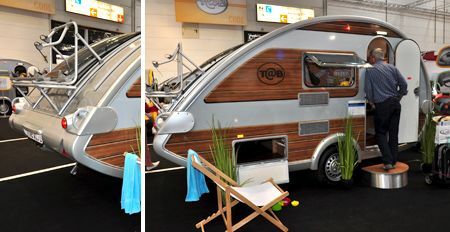 More information at www.caravan-salon.de. If you’re wondering how the show compare’s with the UK’s Motorhome and Caravan Show at the NEC, it’s considerably bigger. 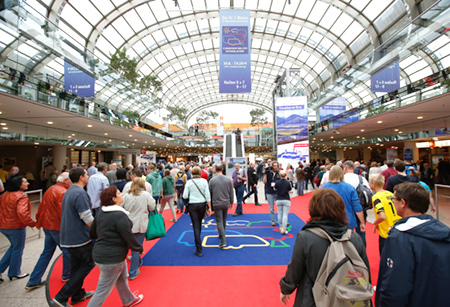 In October 2013, the Motorhome and Caravan Show at Birmingham’s NEC Arena attracted over 100,000 visitors in October 2014. This year the NEC show is set to have over 400 exhibitors on display across 11 halls. Do any of these new caravan models and innovative features take your fancy? Let us know in the comments box below.